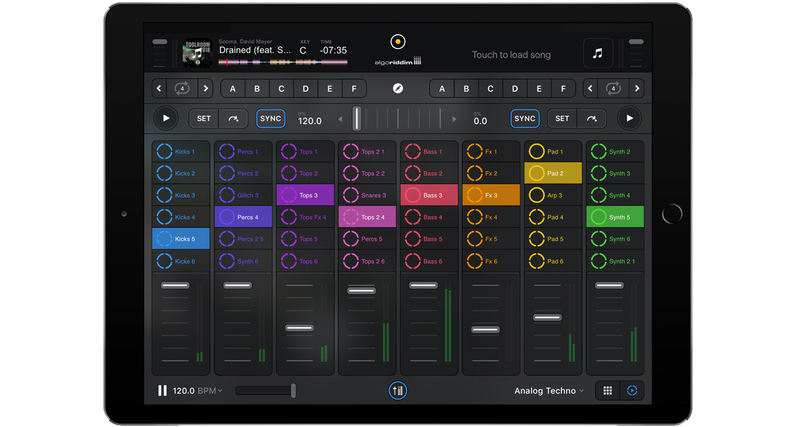 djay For iOS is Algoriddim’s next-gen iOS DJ software, and it unifies all previous Algoriddim iOS apps with basic features available for free, and more advanced features available under a monthly subscription. It’s an amazing app that gives you power and features similar to what you’d find on laptop DJ software, and it’s one of the slickest as well. Existing users may gripe about the new subscription model for djay Pro, but other than that it’s a no-brainer update. One of the best and most versatile DJ apps in the market right now. 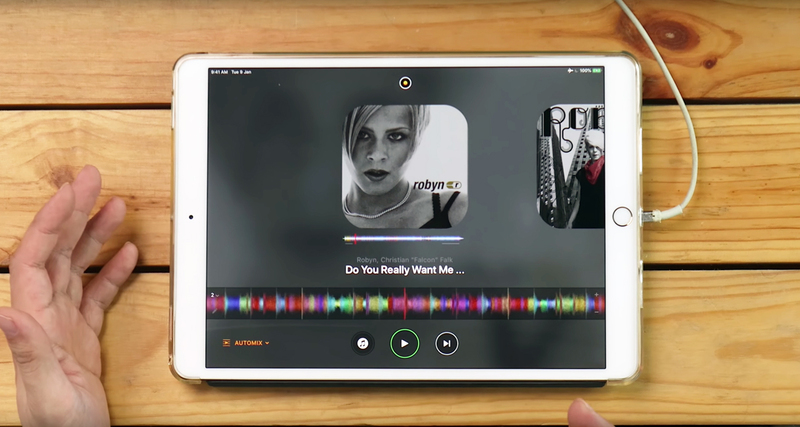 djay For iOS is the latest incarnation of Algoriddim’s djay app, and it unifies all other iOS djay versions into one (previously you had djay Pro, djay 2, and so on). It retains the familiar djay look as well as features including two and four-deck mixing, AI-powered Automix and Spotify streaming. New features in this version include a streamlined user interface that lets you easily switch from among djay’s screens (more on that later), plus is now a monthly subscription option that gives you access to even more features. The subscription is called “djay Pro” and it costs US$4.99/month. You get more AI Automix options, Midi mapping, video mixing, the brand new Looper feature that lets you improvise and trigger loops and samples on the fly, and access to video and audio loop packs. For the purposes of this review, we’ll be taking a look at the djay Pro subscription version. I downloaded djay For iOS from the App Store onto my iPad Pro, signed up for djay Pro and got to work. One of the new features on djay For iOS is the redesigned interface that puts DJ performance essentials front and centre. 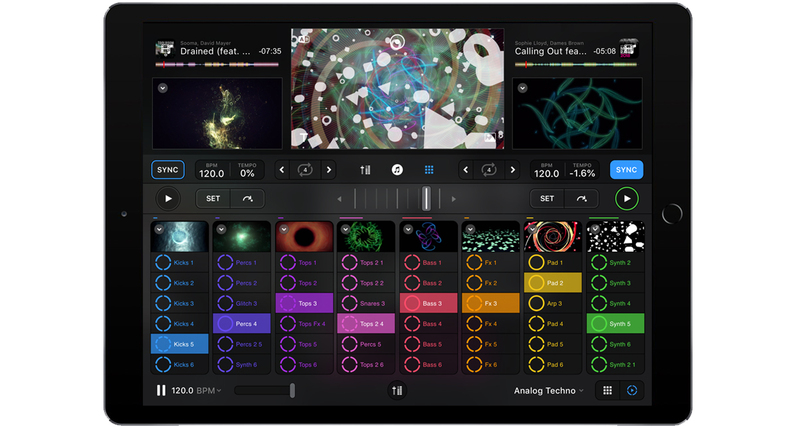 Those familiar with previous iterations of djay (djay Pro, djay 2) will find a more optimised version of the two-deck and four-deck screens – for example, on the two-deck screen the interface is now split in half with the decks at the top and the library at the bottom, making it easier to browse your library while mixing. There are now seven different modes available in djay Pro: Classic, Automix, 2 Decks, Looper, 4 Decks, Single and Video. Classic mode gives you the “two turntables and a mixer” graphic interface that’s been a staple of the djay app since its inception. Automix lets you pick songs for djay to mix automatically, and it lets you adjust settings like transition type and duration. 2 Decks splits the screen in half as mentioned earlier, giving you access to both the decks and your library at the same time. Looper is an 8×6 grid interface that you can load sounds for triggering and improvising while you spin. 4 Decks lets you mix with up to four songs at the same time. Single mode is for song preparation, letting you place hot cues in a single track that appears at the top of the screen. Finally, Video mode lets you mix with video files. The brand new Looper feature lets you launch clips, samples and loops that are in sync with whatever it is that you’ve got playing in your decks. It’s easy to use and is great for live remixing: add percussion loops, drums, melodies and even basslines on top of a track you’re playing. Or you can try transitioning from a song playing in a deck over onto a drum loop that you’ve got going in Looper, and then building a song from scratch by triggering more loops and samples. It’s very easy to do, and quite fun – I found myself messing around with it for extended periods, turning what would’ve just been a simple song transition into a jam that makes sense. Part of the reason why Looper sounds good and is because it comes with loops and samples pre-loaded from Loopmasters, and if you’re a djay Pro subscriber you get access to even more packs available from the djay Store for free. There are lots of packs to choose from across different genres including deep house, dub, EDM, latin, drum ’n bass, trance, and even Melbourne Bounce. It would be awesome if you could load your own sounds to Looper, but at the moment you can’t. Perhaps in a future update? The ability to mix video in djay Pro continues to improve. The controls in Video mode have a new, more intuitive layout, plus the lower half of the screen now has the Looper interface which itself has video windows per column. The way it works is whenever you trigger a clip in Looper, the video at the top of that clip’s column starts playing too, letting you mix it into whatever is currently showing on djay’s video output. One of the big new features in the djay Pro subscription version is the ability to map just about any Midi controller for use with djay. Midi Learn has been added, making control mapping easier. The new iPad Pro models come with USB-C onboard, so in theory you’re able to plug in any Midi controller whether it’s a keyboard, grid pad, or knob / fader pack and get it to work with djay. We’ve not had a chance to test it just yet because we don’t have our hands on a new iPad Pro at the time of this writing, but we’ll give you a full report once we do. 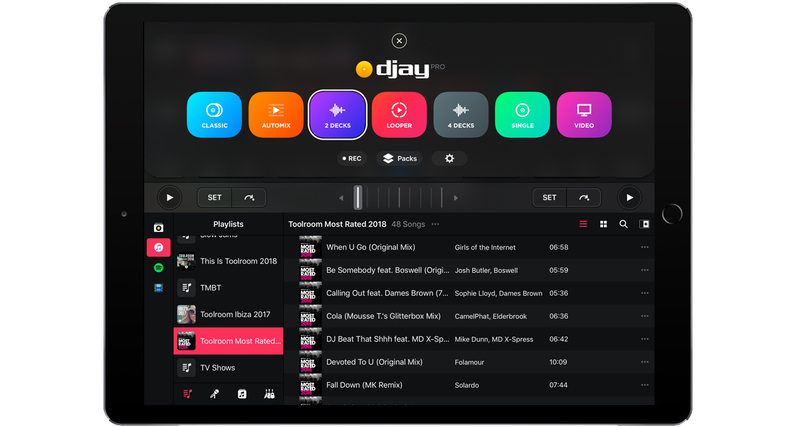 djay For iOS is the latest and greatest version of djay which was first launched back in 2010 (a Mac-only version was first released in 2007). 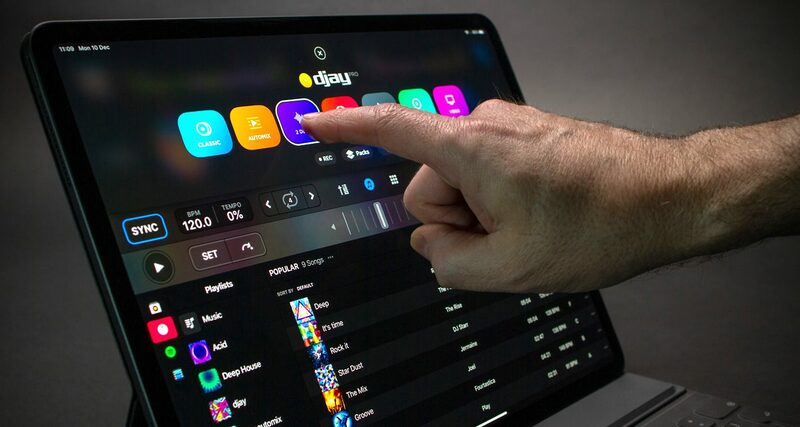 It brings cutting edge digital DJ features to your fingertips, and Algoriddim has done a fine job of putting the essential controls and commands front-and-centre, which helps keep the interface as clean as possible which is a feat given how powerful the app is. The new Looper feature is well-implemented and easy to use, plus the included loop packs sound great. Algoriddim says more packs are coming, which will help boost the usefulness of Looper since there is no way to add your own sounds at the moment. The most important new feature, especially for iPad Pro users, is universal Midi compatibility. Midi Learn makes it easy to program controls using whatever Midi gear you’ve got, though the jury is still out on whether or not USB-C plug and play is as simple as it sounds. As mentioned earlier, we’ll give it a thorough test once we’ve got the new iPad Pro in our review studio. The only downside to djay For iOS is the new subscription model for djay Pro. It may irk longtime users who have spent for earlier versions of the app, but this is the way forward for many other software companies in the DJ industry (Serato and Pioneer DJ, for example) and it’s reasonable for Algoriddim to follow suit if it leads to sustainability down the road. Overall, an important update for djay that shows just how much iOS DJing has grown and matured. Recommended. One drawback, for me at least, is no external mixer mode utilizing an iPad. Been getting the hang of using this on my iPhone with a bluetooth speaker. A bit of latency on the audio takes some getting used to but everything you need is right here. If I could “easily” export my rekordbox cues/beatgrids to iOS DJP that would be the dream. Hi there, I have been loving my time with the new djay app especially because of the looper and more complex controls and hotcues. I would like to use my iPad to play some pool parties casually with friends, does anyone have a suggestion for a high quality output for the iPad via Lightning? I also have the pre-cue split output cable that I would like to use with it as well. There are so many little adapters and audio devices out there that I’m kind of lost. Any help would be so appreciated! Thank you! The pre-cue splitter cable would actually work fine, your output would be in mono but that’s no great issue for parties. Why not consider getting a DJ controller like a Beatpad 2 or Mixon 4? This would make it far more fun to DJ, and give you high quality headphones and audio outputs too. For some reason the video visuals is only working on deck 1, but not deck 2. Other then great dj software.